Looking for a church in Raymore? New Vision Church is a contemporary church located in Raymore, Missouri. We are dedicated to helping you in your spiritual journey with Jesus. Whether you are a lifelong Christian or just asking questions, we invite you to check us out. The best place to start is by joining us for a worship service this Sunday at 10 a.m.
We understand that it is normal to feel a bit uncomfortable when visiting a new church. Our goal is for you to be comfortable and relaxed so that you can connect with God without distractions. We have provided the information below to help you know what to expect, where to park, etc. The worship services at New Vision Church feature lively music, practical and Bible-based messages, and quality nursery and kids programming. You will be greeted by several friendly people, but we will never embarrass you or ask you stand up and tell us your name. Also, while we do take an offering, we don’t expect our guests to give. We believe that God cares more about what is inside us than he does about what is on the outside. At New Vision you will see people dressed casually in jeans, khakis, shorts, and t-shirts. You will not stand out if you are dressed comfortably. Our services begin at at 10 a.m. every Sunday. Coffee and refreshments are served 20 minutes prior to each service and many of our members arrive early to enjoy some food and friendship. It is usually best to plan to arrive a little early so that you can find a seat- it is difficult to worship God when we are rushed. If you are late, don’t worry – please just find a seat quickly and try not to distract those around you. We do our best to respect the busy schedules of everyone in our services. Services typically last an hour and fifteen minutes. If you must leave early, please leave quietly. We have many parking spaces in front of our building and on the north side, along 58 Highway. If you are unable to find a space, feel free to park in the spaces in front of the dance studio to our south, or in the parking lot of the offices behind the church. We have handicap spaces directly in front of our lobby doors. 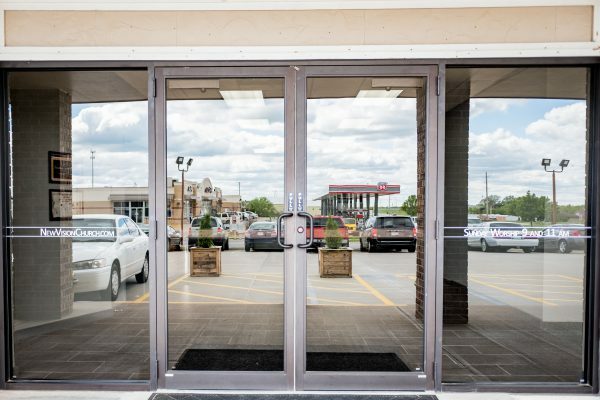 When you approach the building, you will notice that there are several entry doors, as our building was originally constructed for commercial storefront usage. For worship services, please use the double doors, they are the main entrance. Please note, the door directly underneath our steeple leads to our office area, which is closed during worship services. 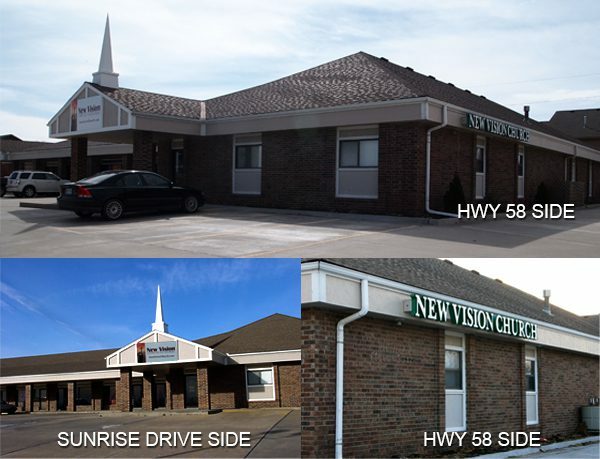 New Vision Church is located on the east side of Raymore at the corner of Highway 58 and Sunrise Drive. Our physical address is: 100 S. Sunrise Dr., Raymore, MO 64083. If you are coming on U.S. Highway 71, exit at MO State Hwy. 58, also marked for Belton – Raymore. Then go east on 58 Hwy. (towards Raymore, away from Belton) for approximately 3 miles. Turn right onto Sunrise Dr. and then make an immediate right turn into our parking lot. If you reach J Highway you have gone about ¼ mile too far. If you are coming from the east, proceed into Raymore on MO State Hwy. 58, past J Highway, and turn left onto Sunrise Dr., and then make an immediate right turn into our parking lot. Please be aware that our building is easy to miss. It is not a traditional church building. We have a short white steeple over one entrance, and you will find a sign with our name on the north side of the building, facing Highway 58. Our building is a one-story, red-brick building on the southwest corner of Highway 58 (also known as E. Walnut St.) and Sunrise Drive.